Shenzhen Xunlong’s Orange Pi family is a nice collection of low costs ARM Linux development boards that can be used in all sort of projects, just like Raspberry Pi boards, but cheaper at the cost of requiring more skills, and/or efforts to complete a project. One popular use for Orange Pi boards is retro gaming thanks to community supported images like RetrOrange Pi supporting games for Atari, Amiga, DreamCast, and other consoles. The implementation looks good enough for startups to sell their own products based on Orange Pi hardware and RetrOrangePi software, as we’ve already seen with RetroEngine Sigma Retro Game Console which had a very successful Indiegogo campaign with $629,368 USD raised. 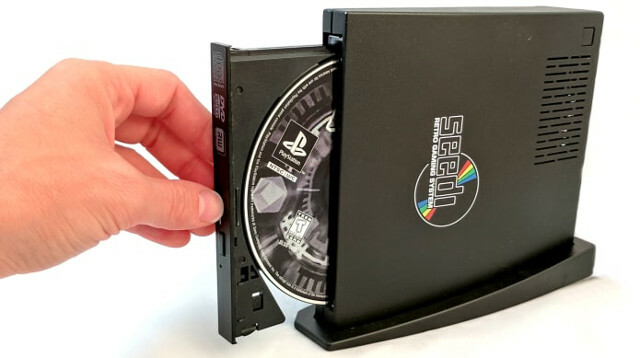 “Seedi Team” has now launched their own game console apparently based on Orange Pi Lite, but it’s a little different as instead of copying “ROMs” , you can simply insert your old CD-ROMs or DVDs. The CD/DVD drive can play PSX, TurboGrafx, Neo Geo, and Sega CDs, but you can also read any other CD or DVD disks, as the drive is allegedly region-free. A separate Retrode adapter will allow you to use cartridges to play games from Sega Genesis, Game Boy, etc… For other platforms, including NES, MAME (arcade), Atari 2600, or TurboGrafx 16 you can always load the ROMs in other ways. Ports of Doom, Quake, or other DOS games are also available. The console launched on Indiegogo a few weeks ago, and raised a little over $20,000 out of its $50,000 target. 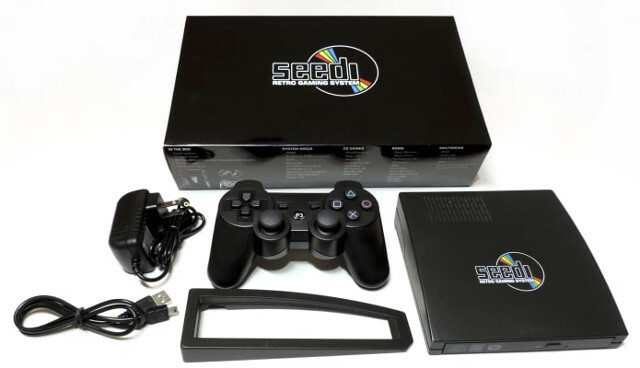 A Seedi System with a vertical stand, a Bluetooth game controller, a controller charging/pairing cable, and power adapter requires a $125 pledge, and they also have other rewards with a retro green case, or multiple controllers. The cartridge reader is not sold in the crowdfunding campaign. Shipping adds $10 to the US, $15 to the rest of the world, and delivery is scheduled for March 2018. They’ve sent early prototype to reviewers, and I included one of those video reviews below. I’m interested in the case only.